Minnesota State University, Mankato men's hockey team boasts one of the most diverse rosters in college hockey when it comes to the place these players call home. The 26 man roster includes players from 11 different states, three different Canadian provinces, and three different countries. Some of these players come from fairly non-traditional hockey markets, including the team's leading scorer. 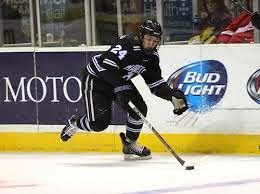 Senior forward Matt Leitner, a native of Los Alamitos, Calif., came to MSU after three seasons in the United States Hockey League and made an immediate impact for the Mavericks as a freshman. As a rookie in 2011-2012, Leitner posted 11 goals and 18 assists to lead MSU in scoring with a point total of 29, very respectable numbers for a freshman. The next season the California native posted a career high 17 goals and 47 points to lead the Mavericks to the NCAA Tournament for the first time since 2003. Averaging over a point per game made for an impressive season for Leitner, but he carried that success into his final two seasons to etch his name next to some of the all-time Maverick greats. In 2013-2014 as a junior, Leitner posted a career high 33 assists and scored 12 goals of his own for a 45 point season in 39 games. He also broke the 100-point barrier on January 31st of last year during a game at Northern Michigan, a feat accomplished by only a handful of Mavericks throughout their careers. This season, Leitner has been continuing the success he's had at MSU, and is currently leading the Mavs in scoring with 24 points. Not only could he be the Mavericks' leading scorer by season's end for a fourth consecutive year, he could also find himself as the program's no. 1 scorer by time his career in Mankato is over. 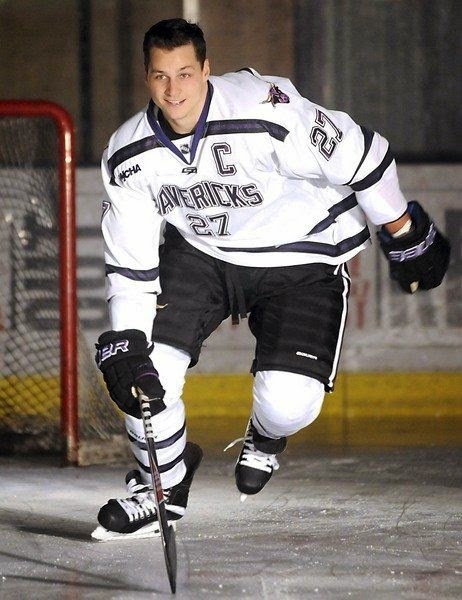 With 145 points in his career, Leitner stands only 19 points behind former Mav Aaron Fox's 164 point career as the leading scorer of the Maverick hockey program during the Division I era. Fox played for MSU in their first years as a Division I program from 1996-2000, and his record has stood for nearly 15 years now. Leitner would have to finish out as strong as he has the past two seasons to eclipse this mark, but it definitely is not out of reach. With 92 points in 80 games over the previous two seasons, Leitner has a legitimate shot at leaving MSU as the leading scorer of the men's hockey program during the Division I era. With 12 regular season games remaining on the schedule and a potential to have as many as nine postseason games, Leitner just needs to keep pace with what's been working for him so far during his senior season. Leitner is widely regarded as one of the best passers in college hockey, as shown by his nomination for the Hobey Baker Award as the top player in the nation. The only knock on the Mavericks' leading scorer is that he passes too much, often passing up opportunities to shoot the puck. With the career he has had, he should not be counted out as a possible winner of the award, but his goal total might make it hard for him. His five goals on the year seems less than elite, until you look at his assists. Leitner's greatest strength is his ability to get players the puck who seemed far out of reach. The way he sees the ice is an art form that can only be compared to stringing thread through a needle, finding near impossible openings and making them happen. He leads the Western Collegiate Hockey Association with 19 assists this season. While Leitner leads this Maverick team that is a threat to win an NCAA Title, he may also leave his mark on the program's record books by season's end. With the formation of the Big Ten Hockey Conference and the National Collegiate Hockey Conference prior to last season, it seemed as if some of the greatest rivalries in college hockey had died. The Western Collegiate Hockey Association saw over half of the teams in their conference leave the league for these new conferences, and it was hard to see what was widely considered the top conference in college hockey to be dismantled. 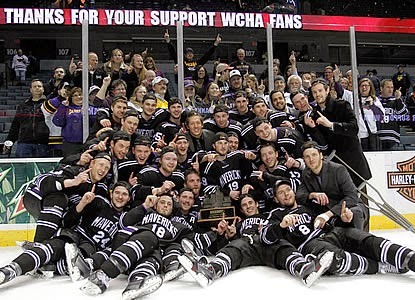 Some of the rivalries formed in the old WCHA had been established over 40 years ago, so it was hard to imagine going through the season not seeing these teams battle it out for a conference championship. However, there were a few ways these teams were able to salvage the rivalries they once had in the old WCHA. The hardware that's on the line this weekend. Minnesota and Wisconsin headed for the Big Ten, leaving some of the rivalries untouched. Other teams now playing in separate conferences have done a good job scheduling non-conference match ups against one another to continue these longstanding rivalries. The third way these rivalries were salvaged, was the North Star College Cup. 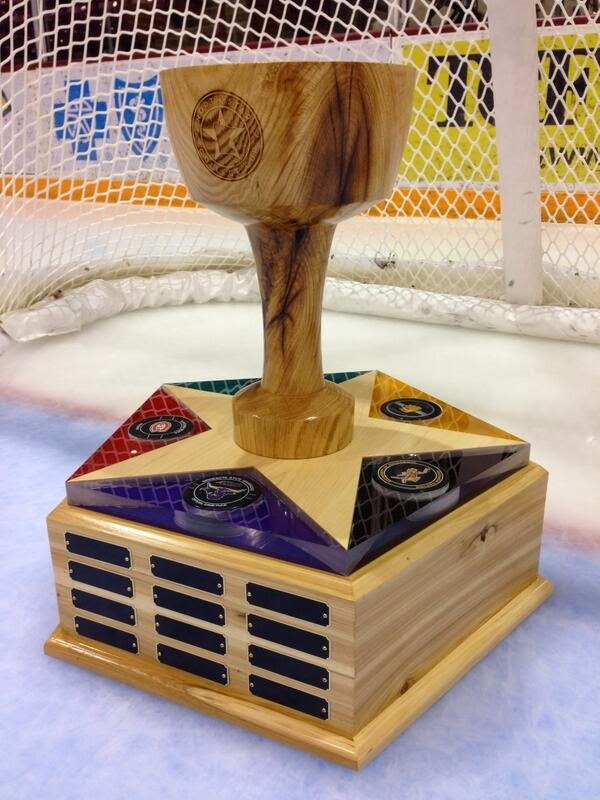 The North Star College Cup is a tournament played at the Xcel Energy Center in St. Paul, Minn. that was created to keep the old WCHA rivalries going, more specifically, to keep the in-state rivalries between the Minnesota teams going. Last year was the inaugural NSCC tournament, with the University of Minnesota winning the championship with a shootout victory over Minnesota-Duluth. St. Cloud State University would win the consolation championship with a 6-4 win over Minnesota State University, Mankato. This event is good for fans to come together in the familiar confines of where they gathered for years to watch these teams battle it out for the conference title, and good for the teams to play their in-state rivals in front of a familiar crowd. Though these games don't carry any weight in the standings of the teams' respective conferences, they do factor into the NCAA pairwise rankings for the postseason, along with bragging rights on the line. The tournament kicks off Friday at 4 p.m. with Minnesota-Duluth taking on Bemidji State University, followed by a 7 p.m. showdown between Minnesota and Minnesota State. The tournament continues on Saturday with the two losing teams facing off for the consolation championship at 4 p.m. and the main event title game at 7 p.m..
On Hockey Day Minnesota teams from all over the state face off against one another and help celebrate our roots as the state of hockey. While high school teams took to the ice at Holman Field in St. Paul, the Gopher men's team at Mariucci Arena, and the Wild at the Xcel Energy Center, there was another game being played today a little further south. The Gopher women's team traveled to Mankato, Minn. to square off against Minnesota State in game two of a weekend series. While there were two WCHA points on the line in this contest, it was also a special afternoon as two in-state teams faced off against each other on Hockey Day Minnesota. "Hockey Day Minnesota is always special," said Minnesota State head coach Eric Means. "It's the second year in a row on Hockey Day we've played Minnesota." 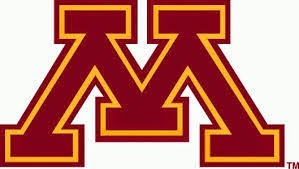 Minnesota, the no. 2 team in the country, was looking for the series sweep and continue their winning ways as they were unbeaten in their last 14 games heading into today's afternoon match up. MSU on the other hand, was looking to come steal some points from the Gophers this weekend and add another win to their record after picking up their first two victories of the season a week ago. "Mankato was coming in after getting their first two wins so they were playing confidently," said Minnesota coach Brad Frost. "We wanted to make sure that we started quickly in both games and I think we did a good job of that here." Start quickly is exactly what Minnesota did. Just 1:26 into the game, Gopher leading scorer Hannah Brandt gave Minnesota a quick 1-0 lead. From there the two teams would trade chances until Minnesota seemed to break this game open just past the midpoint of the first period. Gopher captain Rachel Bona tallied her 12th of the season shortly before Minnesota freshman Kelly Pannek netted a power play goal to give the maroon and gold a 3-0 lead to close out the first period. The Mavs had a chance to get back into this one, but had trouble finding the needed offense to get on the board. Starting the second period on a 5-on-3 power play, the Mavericks couldn't find the back of the net and Minnesota poured it on immediately after killing the two penalties. Minnesota junior Maryanne Menefee scored her fourth goal of the weekend 1:32 into the second period to spot her team a 4-0 lead with the assist going to Brandt. The Gophers would get two more second period goals on Cara Piazza's seventh of the season before Dani Cameranesi tallied on the power play, her 17th goal of the season. With a 6-0 lead heading into the third period, MSU was looking to get on the board before this game was all said and done, and they did that before the midpoint of the final period. Maverick freshman Hannah Davidson scored her fifth of the season to put MSU on the board on a pretty passing play where she redirected a Nicole Schammel pass into the Minnesota net to bring the game to 6-1. That's where it would end for the Mavericks, however, as Minnesota would add one more before the final buzzer when Gopher sophomore Lee Stecklein buried her first of the year during 4-on-4 play when she walked out of the corner and around MSU goaltender Brianna Quade for the score and a 7-1 Gopher victory. While MSU had a handful of scoring chances, they just couldn't seem to find a way to get their shots through, and like many teams around the nation, had a hard time containing this potent Gopher offense. "We tried to match up with them today but you look at that top line and you're talking almost 400 career points," said Means. "We're asking some freshmen who are in their 20th game of their career to go out there and handle those girls and that's a tough task for anyone, let alone freshmen." Minnesota would leave Mankato with a 7-1 win and the series sweep. For one of these Minnesota teams, the day ended in sweet victory, while the other suffered their third straight loss. Though both teams can appreciate playing on this special day and celebrating our hockey heritage in this great state. "Hockey Day in Minnesota, where else does it happen in the United States?" said Minnesota coach Brad Frost. "It's such an honor and privilege to coach at the University of Minnesota and to be able to have two Minnesota teams square off here today was pretty fun." It's no secret that Minnesota is an appealing destination for college hockey recruits. The state boasts the highest number of native players going on to Division I programs, many of whom want to stay close to home while they continue their careers. With five Division I programs in the state, it makes sense that you'll find a number of homegrown players on each roster. For years, the University of Minnesota picked the top recruits in the state in dominating fashion, and continue to get a solid crop of young men each season who want to pull the maroon and gold sweater over their shoulder pads. But the emergence of other programs in the state has made the recruiting process a little more interesting, and a little less cliche. While the Gophers are still the most recognizable college hockey program in the state, others have made waves in recent history. Bemidji State University made a surprise appearance to the Frozen Four in 2009, two years before the University of Minnesota-Duluth won their first National Championship in 2011 at the Xcel Energy Center in St. Paul. St. Cloud State added their name to the board in 2013 with their first Frozen Four appearance. While BSU has found themselves to be a middle of the pack team since their deep run in 2009, both the Bulldogs and the Huskies have managed to stay relevant among the top teams in the nation over the past few seasons. There's only one program among the five Division I hockey teams in the state that seemed to be falling behind. 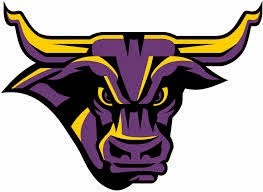 Minnesota State University, Mankato held the reputation of a doormat in the WCHA for years since their inception into the league in 1999. It was time to reevaluate the way things were being done and find a way to compete with these teams they were falling to on a weekly basis, and they did just that. Mike Hastings was hired as the new head coach in the summer of 2012, only the third coach in the program's Division I history following Troy Jutting's eleven year tenure. Hastings came from the University of Nebraska-Omaha, where he was associate head coach to Dean Blais. Before that, the Crookston, Minn. native spent a season under Don Lucia at Minnesota following a 14 year coaching career with Omaha of the USHL, where he never had a losing season. Hastings was inheriting a team which finished 11th in the then 12 team WCHA, and hadn't qualified for the NCAA Tournament since 2003. There was optimism, of course, but no one expected a dramatic turnaround. Rather, it could have been assumed that the coaching change would take a few seasons until Hastings had his own recruits before any significant differences were made. But Hastings was set on making his mark immediately. In his first season behind the Maverick bench, Hastings brought the team that was 12-24-2 in 2011-2012 to their first WCHA Final Five and NCAA Tournament appearances in ten seasons with a 24-13-2 record, setting the program record for single season wins in the Division I era. Nearly a complete 180 degree turnaround. The next season, he would do it again. In 2013-2014, the Mavericks powered through the new-look WCHA, continuing to build on the foundation they set the season before. They managed a second place finish in the WCHA regular season standings, one point behind MacNaughton Cup winner Ferris State. MSU went on a run, going 12-0-1 in the 13 games leading up to the NCAA Tournament. Over that span, they won their first Broadmoor Trophy as the WCHA Final Five champions en route to their second consecutive NCAA Tournament appearance. Though the Mavs fell short, losing 2-1 to UMass-Lowell in the NCAA Northeast Regional Tournament, it solidified their spot as a respected program that can contend for a spot in the Frozen Four. Fast forward to this season, Minnesota State stands 16-4-1 on the year and was billed the no. 1 team in the nation on Monday, the highest ranking in program history during the Division I era. They sit atop the WCHA standings and also rank first in the NCAA Pairwise rankings. With the way things have been going for MSU, it appears they are headed for a third straight NCAA Tournament appearance, and a chance at setting the program record for single season wins once again. With the success of this southern Minnesota program the past few seasons, it also seems they may be putting themselves in the hunt for some of the area's top recruits. Case in point, Elk River's Jake Jaremko, an MSU commit, has 45 points in 15 games this season for the Elks. And with Hastings' history of coaching in the USHL, it appears the Mavs may also continue to land recruits out of junior hockey who are older, bigger, and more experienced by time they arrive in Mankato. While a program's success is evaluated on a year-to-year basis, Minnesota State has appeared to emerge as a team to compete with, no longer a doormat. In regards to college hockey in Minnesota, the Mavericks are the little brother no more. victory over Ferris State last season. made the NCAA Tournament the previous season. Heading into the season, it seemed to be MSU, then everyone else. That wasn't the case, though. 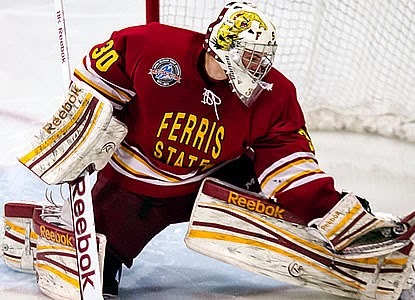 The Ferris State University Bulldogs were possibly the biggest surprise in college hockey last season. FSU cruised through the first half of the 2013-2014 season, going 17-3-3 into mid-January, including an impressive 12-0-2 in WCHA play to that point. The Bulldogs ranked as the no. 2 team in the country and were among the chatter as a possible NCAA title contender, but then a rivalry was formed. "After all the games we played against them last season, it's safe to say we will have a rivalry that will last a long time." said senior captain Brett Stern. FSU came to Mankato last January for perhaps their biggest test of the season. Running away with the WCHA regular season title, the Bulldogs were put into shock by the Mavericks. The Mavericks, who were not ranked at the time, dismantled FSU in a 6-2 Friday night victory. It could have been viewed as a fluke or an off night for the Bulldogs, but MSU followed it up with a 4-3 victory the next night for a series sweep which put them in the race for the conference title. Though Ferris State would go on to win the MacNaughton Cup as the WCHA regular season champions, finishing one point ahead of MSU, it was the Mavericks who would have the last laugh. These teams would meet once more during the season, with the stakes a bit higher. The third and final meeting between these rivals was in Grand Rapids, Mich. at the WCHA Final Five tournament, where the Mavericks prevailed 4-1, giving them their first conference tournament championship and their second consecutive NCAA Tournament appearance and a 3-0 record over the Bulldogs for the season. Both teams would fall in the NCAA Tournament, falling short of the Frozen Four, but this weekend they meet again, this time the roles are reversed. The Bulldogs were expected to be just as good this winter, and were even ranked as high as no. 4 in the country early on this year. But FSU has had a tough time getting back to where they were last season, and have compiled an 11-11-1 record so far this season, including 8-6 in WCHA play. Though FSU doesn't seem to be the same team as they were a year ago when these two teams met, they cannot be overlooked. The Bulldogs carry one of the best goaltenders in the country, despite his record indicating otherwise. C.J. Motte is a Hobey Baker Award candidate. On the other side, MSU comes into this weekend after being named the no. 1 team in the country on Monday, the highest ranking in program history. It's deja vu of sorts, but this time it's the Bulldogs who want to prove themselves. The Mavericks have gotten off to their most consistent start in recent history, going 16-4-1 so far this season. MSU has notable wins over no. 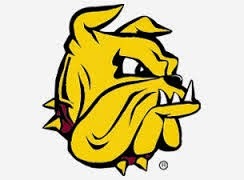 5 Minnesota-Duluth, no. 8 Nebraska-Omaha, and no. 11 Michigan Tech, who were the no. 1 team in the country with a 12-0 record before the Mavs handed them a series sweep. While the Mavs have been ranked among the top ten in the nation for much of the season, there is perhaps a bit more pressure now to remain at the top. They do have the tools to do so, however. "We have to realize what got us to being no. 1 in the country and stick with our plan," said Stern. "Now that we've made it to no. 1 we set the bar for ourselves a little higher and need to work that much more day in and day out to stay in that spot." Starting from the back end, Stephon Williams has been lights out in goal. Boasting a 12-2-1 record, Williams has managed a stingy 1.8 goals against average paired with a .917 save percentage, returning to his former glory of two seasons ago when he was named both WCHA Rookie of the Year and WCHA Goaltender of the Year. Up front, the Mavericks have been getting offense everywhere. That's not an exaggeration, either. MSU has nine players who have recorded ten or more points on the season, three of whom have already eclipsed the 20 point barrier. Senior Matt Leitner leads the way with 23 points on the season, and his 18 assists are the most in the WCHA. Behind him, junior forward Bryce Gervais has a WCHA best 13 goals on the year and 20 points to boot. this season by scoring three goals in a single game. Their depth is definitely their greatest asset. "We have more than four lines of forwards and three sets of defense that I feel comfortable playing with in any game." said Stern. Not only does MSU claim the top spot in the NCAA rankings, they claim the top spot in offensive production in the country, averaging 3.86 goals per game. With Motte being the bright spot on this Bulldog squad, it seems the Maverick offense may be too much for FSU this weekend. "This weekend will be a battle," Stern said. "Going into someone else's barn and playing is tough, and going against a rival is even more tough." The puck drops at 7:07 p.m. Friday and Saturday night in this two game series at the Robert L. Ewigleben Ice Arena in Big Rapids, Mich. with four meaningful points on the line. The Minnesota State University, Mankato men's hockey team had a good first half of the season heading into the new year. Arguably their best start to a season in the program's division I history. The Mavericks are currently ranked no. 4 in the nation, after previously being ranked no. 2 back in December, the highest ranking program's history. At 16-4-1 and 5-0-1 in their last six games, MSU has an opportunity to reach a fairly impressive milestone for the third consecutive season. behind the bench, Hastings' broke his own record when his team won 26 games en route to their second consecutive NCAA tournament appearance. With fourteen games remaining on the schedule for the Mavericks, not including the WCHA playoffs and NCAA tournament, the Mavs are certainly capable of reaching the 27 win mark, or possibly higher. Going 13-2-1 in WCHA play over the first half of the season, MSU sits atop the conference standings, with a comfortable lead over second place Michigan Tech, who has two games in hand. Last season, a tie against Tech in the last game of the season cost the Mavericks a share of the MacNaughton Cup as the WCHA regular season champions. If they can keep on the track they're on now, the Mavs could come away with their first MacNaughton Cup in school history. Matt Leitner leads MSU with 23 points. Aside from being ranked the no. 4 team in the country, MSU is also the top ranked team in the NCAA pairwise rankings, the rankings which determine the seeding of teams for the NCAA Tournament. So how have the Mavericks been so good this season? Simply put, depth. Mavs have been getting scoring from all four lines on any given night, which makes them tough to contain for opponents. On the back end, defensemen Casey Nelson and Zach Palmquist are among the top scoring defenders in the country. Nelson, who saw limited playing time as a freshman, has now stepped into a much larger role and has posted five goals and 18 points in 21 games this season. Palmquist has 17 points of his own and often sees large minutes on the power play. Perhaps the biggest surprise for this Maverick team is the play of their starting goaltender. Not surprising because he isn't capable, but surprising considering the way things went last season. Junior goaltender Stephon Williams won WCHA Goaltender of the Year honors in 2013 to go along with the WCHA Rookie of the Year. As a sophomore last season, Williams not only lost the starting job to freshman Cole Huggins, but Huggins would go on to win the awards Williams won the season before. This season, Huggins seemed poised to be the starting goaltender, until Williams stole the job back. Since then, Williams has gone 12-2-1 this season with an impressive 1.89 goals against average and a .917 save percentage with two shutouts. Williams has gotten his fair share of help, though. The Mavericks have the top offense in the country, averaging 3.86 goals per game. The fact that their scoring is dispersed throughout their deep roster makes this even more impressive. Moving forward, the Mavericks have a tough schedule to round out the regular season. Coming up is a pair of weekend series' against last season's MacNaughton Cup winner Ferris State sandwiched around the North Star College Cup in St. Paul, where MSU will face off against the University of Minnesota, and then either Bemidji State or Minnesota-Duluth. This weekend MSU heads to Big Rapids, Mich. for their first series against the Ferris State University Bulldogs. FSU was ranked as high as no. 2 last season but have had trouble getting back into the top 20 this season. It should be a good test for the Mavericks heading into the final stretch of the regular season. The Minnesota State University, Mankato men’s hockey team was expected to be good this year. They are expected to beat the lesser teams in the country, but when you’re ranked among the top ten in the nation, nearly everyone is a lesser team. A sweep over Michigan Tech two weekends ago, who were ranked no. 1 at the time, showed just how good this Maverick team is, and extended their winning streak to four games. This past weekend, the Mavs kept things rolling and extended that streak to six. The Mavericks who are now 11-3-0 (9-1-0 in the WCHA), headed to Sault Ste. Marie, Mich. on Friday for a series against the Lake Superior State University Lakers. LSSU, who won a pair of national championships in the early nineties when they played in three consecutive title games, have since fallen from grace. After a 0-9 start to the season, the Lakers picked things up a bit, going 3-2 after their first nine heading into the series against MSU. Their turnaround pretty much ended there. On Friday night the Mavericks won in dominating fashion. Junior Brett Knowles, who had been sidelined until two weeks ago after he had hip surgery over the summer, stole the spotlight that night. Knowles opened the scoring early in the game with the eventual game winner when he redirected a Sean Flanagan shot past the Laker goaltender. Knowles would tally again in the second period, sandwiched between a pair of Chase Grant goals before junior Teddy Blueger would score on a rising wrist shot from afar to give the Mavericks a four-goal second period. In the third period, Casey Nelson wristed a power play goal past LSSU goaltender Gordon Defiel to extend the lead to 6-0 before Knowles would split the Laker defense on his way to a highlight reel breakaway goal for his third goal of the night and a 7-0 win. Both goals were scored on the power play. It was the third hat-trick of the season for MSU, with Blueger and junior Bryce Gervais both recording three-goal games earlier this season. It was the first for Knowles, who scored his only goal of last season in the WCHA Final Five title game, and this hat-trick included his first three tallies of the 2014-2015 season. Stephon Williams recorded 24 saves in the win, posting his first shutout of the season. Saturday night didn’t see quite the scoring barrage that Friday’s game did, but it was still a game in which the Mavs controlled much of the play. Junior forward Dylan Margonari put the Mavs on the board towards the end of the first period on his fourth goal of the season when he batted a puck out of the air and into the Laker net. The goal was initially called off, but after video review the goal stood. The game was relatively quiet after that until the third period when MSU scored a pair of goals just over a minute apart to give them a cushion. Zach Stepan netted his first of the year when he collected a loose puck in the slot and roofed it over the shoulder of Defiel. Shortly after, Matt Leitner came rushing down the left side and found an opening past Defiel for his fourth of the season to extend the lead to 3-0.
emerged as the starting goaltender for MSU. Williams would again earn a shutout victory after he made 21 saves, giving him an 11-1 record on the season. Impressively, his stats have gotten even better. After posting two shutouts on the weekend, Williams now holds a 1.52 goals against average, and a .931 save percentage. 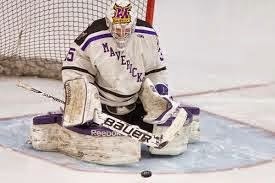 His .917 winning percentage is the highest among WCHA goaltenders. Williams playing his best hockey since his WCHA Goaltender of the Year season two years ago is a good sign for the Mavericks. While the Mavericks have the second best offense in the country, averaging 3.79 goals per game, having a goaltender who on average allows less than two goals per game puts a team in good position to win. Still in second place in the WCHA behind Michigan Tech University, the Mavs have played two games less than MTU and should be in good position to move ahead of them for first place in the conference as the Huskies have this weekend off from games. The Mavericks take the ice again this weekend when they return home to play at the Verizon Wireless Center in downtown Mankato. The Mavs play another WCHA series as the University of Alaska-Fairbanks comes to town. After a 6-0 start, the Nanooks from Fairbanks have slipped to a 7-7 record, and 2-6 in the WCHA. These two teams take to the ice at 7:07 p.m. on Friday and Saturday in Mankato as the Mavericks look to extend their winning streak to eight with a sweep over the Nanooks. A student at Minnesota State-Mankato majoring in Communication Studies with a minor in English. 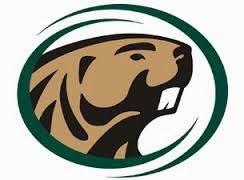 I write sports for the MSU Reporter and use the blog as an outlet for more to see the articles as well as other hockey related items that I do on my own. My hope is that my work can be unbiased and enjoyable to read, and hopefully allows me to make a career of this.